Antiviral therapies are available for cats. Antiviral therapy treats viral infections such as feline leukemia, feline AIDS and feline herpesvirus-1, which sometimes require sustained treatment with antiviral agents to aggressively halt and destroy viral invaders. Three common types of antiviral therapy agents are interferon, nucleoside analogues and amino acids. Additional antiviral agents for cats are in the testing and exploration stages. Interferon is given orally or injected subcutaneously for successive days to treat feline AIDS and feline leukemia. It may also be given to cats with feline herpesvirus-1. Interferon works by switching off protein synthesis in infected cells, preventing infected host cells from multiplying. Interferon also activates the animal's natural immune-system response to battle against the invading virus. While side effects tend to be rare, cats may vomit or lose their appetites after interferon treatment. Only a few types of nucleoside analogues are available for feline use since they can be toxic to cats. Most are applied topically. They work by interfering with the cells' ability to replicate by replacing sugar or base molecules in the nucleotide with substitutes that prevent the cell from binding to receptor cell sites. This keeps viral cells from replicating and halts the spread of the virus. One amino acid, L-lysine, appears to work as an antiviral therapy against the feline herpesvirus. It's administered orally in powder form, usually mixed into the cat's food. It appears to work better if given to cats as soon as they are diagnosed with the virus. Consult a veterinarian before you change your cat's diet or administer L-lysine. Alan Radford, Senior Lecturer in Small Animal Studies at the University of Liverpool Veterinary Teaching Hospital, suggests several other possible antiviral therapies for cats. Anti-flu drugs developed for humans, protease inhibitors and monoclonal antibodies are all potentially useful against viruses, but not all were available for cats at the time of publication. Many in the research and development stage hold promise as antiviral therapies for cats in the future. How Often Should Cats Get a Distemper Shot? What Is FIP In Cats? What Is Panleukopenia Calicivirus Rhinotracheitis Pneumonitis for Cats? 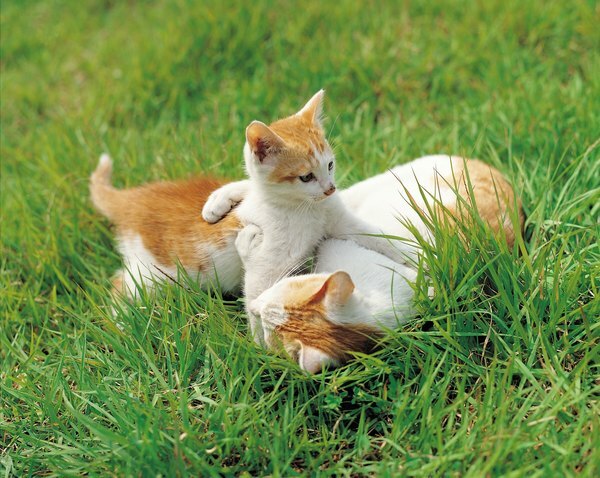 Can Feline Coronavirus Cause Diarrhea in Cats?